In the early hours of the tomorrow morning (Monday 21st January 2019), people in Ireland and the United Kingdom will be able to see a Total Lunar Eclipse. It will in fact be visible across a large part of the Earth’s surface, from Asia to North America. Around these parts the time when the Moon is fully within the shadow of the Earth is about 4.40am until 5.40am (Irish Time). The Moon will be well over the horizon during totality. 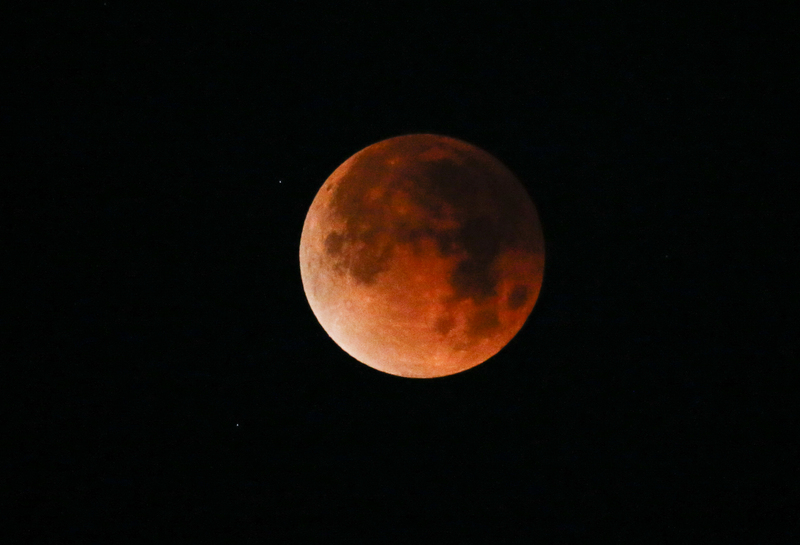 For a combination of reasons this eclipse is being called a Super Blood Wolf Moon. The `Super’ is because the Full Moon will be close to its perigee (and will therefore look a bit bigger than usual). The `Blood’ is because the Moon will turn red during the eclipse, the blue component of light reflected from the Moon’s surface having been scattered by the Earth’s atmosphere. The `Wolf’ is because the first Full Moon of the New Year is, according to some traditions, called a `Wolf Moon’, as it is associated with baying wolves. Other names for first Full Moon of the year include: Ice Moon, Snow Moon, and the Moon after Yule. 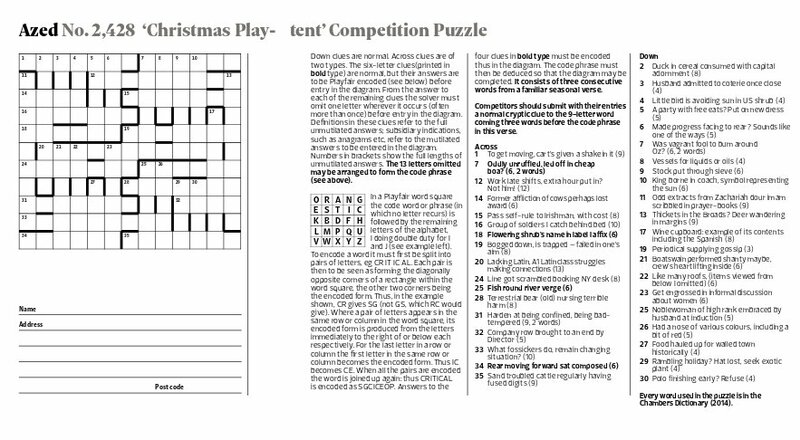 I haven’t done a blog post about crosswords for a while so I thought I’d post a quickie about the Christmas Azed Puzzle Competition (No. 2428), the results of which were announced this week. One of the few things I really enjoy about Christmas is that the newspapers have special crossword puzzles that stop me from getting bored with the whole thing. I had saved up a batch of crosswords and gradually worked my way through them during the holiday. I left the Azed puzzle until last because, as you can see from the image above (or from the PDF here) it looks rather complicated. In fact the rubric was so long the puzzle extended across two pages in print edition of the paper. I therefore thought it was fearsome and needed to build up courage to tackle it. The title `Play-tent’ is a merger of two types of puzzle: `Letters Latent’ (in which solvers have to omit one letter wherever it occurs in the solution to the clue before entering it in the grid) and `Playfair’ which is based on a particular type of cypher. I blogged about the latter type of puzzle here. In this ingenious combination, the letters omitted from the appropriate clues together make up the code phrase required to construct the Playfair cypher grid. It took me about 2 hours to solve this completely, which is quite a bit longer than for a `Plain’ Azed puzzle, but it wasn’t anywhere near as hard as I anticipated. 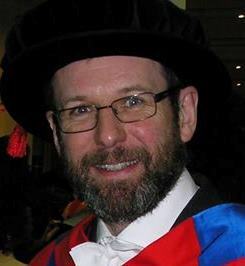 People sometimes ask me how to go about solving cryptic crosswords and I have to say that there isn’t a single method: it’s a mixture of deduction, induction, elimination and guesswork.Leibniz was certainly right when he said that “an ingenious conjecture greatly shortens the road”. If you want to learn how to crack these puzzles, I think the only way is by doing lots of them. In that respect they’re a lot like Physics problems! But solving the puzzle is not all you have to do for the Azed Competition puzzles. You have to supply a clue for a word as well. The rubric here mentions the word three words before the code phrase, i.e. SHEPHERDS. Although I was quite pleased with my clue, I only got a HC in the competition. You can find the prize-winning clues together with comments by Azed here. What’s hot on record? You’ll find pieces written about that in guides! This parses as H(hot)+EP(record) in SHERDS (word for fragments). The definition here is `guides’, which is a synonym for shepherds (treated as a part of the verb form). I’ve said before on this blog that I’m definitely better at solving puzzles than setting them, which probably also explains why it takes me so long to compose exam questions! Anyway, it was an enjoyable puzzle and I look forward to doing the latest Azed crossword later this evening. 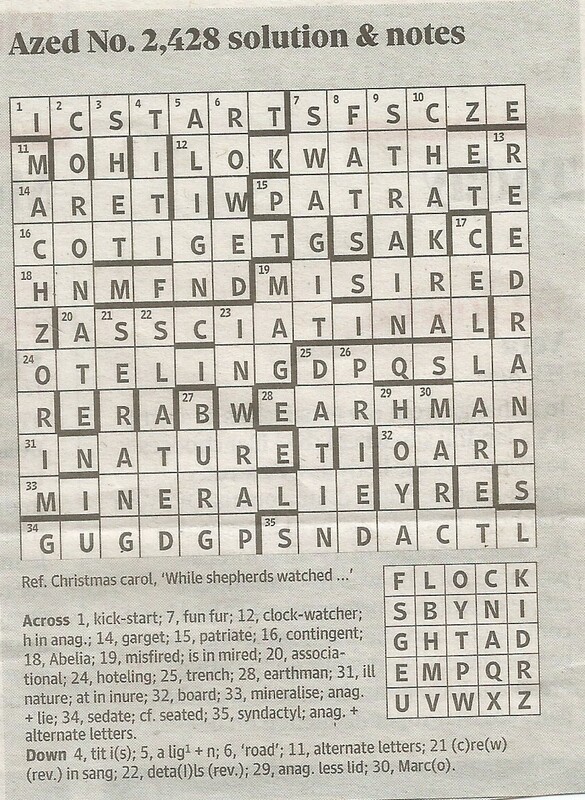 Update: today’s Azed Crossword (No. 2432) was quite friendly. I managed to complete it in about half an hour.